Welding is a common workplace task that requires a great deal of knowledge, training and patience to perform properly and safely. Most welders fully understand how to perform their job properly –it is the ‘safely’ in which most welders lack knowledge, specifically as it relates to industrial hygiene. Given the propensity for welding operations within industry, the first source reviewed was the availability of Material Safety Data Sheets (MSDS) for both nickel and chromium. The data sheets were informative in outlining the respective hazards of the material as generally used. In the case of chromium, it poses a moderate health hazard listed as 2 based on the HMIS (Hazardous Materials Identification System) categorisation standard and a 1 regarding fire hazard. Chromium is also listed as a potential carcinogen by the ACGIH (American Conference of Governmental Industrial Hygienists). Chromium has contact hazard regarding eyes and skin as well as inhalation and ingestion. Dealing with welders’ fume and the rising heat plume associated with it, it can be easily seen that an exposure is presented. Under Section 8 of the MSDS, exposure controls for personal protection are outlined, which include engineering controls, local exhaust ventilation or other engineering controls to keep airborne levels low, and personal protective equipment is generally outlined as splash goggles, lab coat and dust respirator. Other recommended exposure limits as based on NIOSH, United Kingdom and Canada all indicate levels of 0.5 Mg/M3 for exposure. The nickel MSDS was informative in presenting the general hazard information. Nickel is also considered a carcinogen and has the same contact problems regarding eyes, skin, inhalation and ingestion as chromium. Nickel requires engineering controls inclusive of local exhaust and similar PPE requirements as listed for chromium. Exposure limits on the MSDS and as verified within the NIOSH Pocket Guide2 indicate a TWA eight hour exposure limit for OSHA as 1 Mg/M3 with the ACGIH indicating the same level and other recommended exposure levels presented by the United Kingdom as 0.5 Mg/M3. As can be seen, both materials present low levels of allowable exposure and it is absolutely necessary to avoid skin contact, eye contact and inhalation. In an article entitled Hexavalent Chrome Exposure Factors from Welding Operations, Jerome Spear (www.experts.com) outlines the use of chromium and indicates, “Chromium has been used commercially in the US for more than 100 years. Given this consideration, it is necessary to highly safeguard these operations through extensive review, testing and operational set up. It is interesting to note in this article that Spear makes a general comparison to other exposures, “However, in most mild steel welding, the exposure limits for fume constituents other than CR[IV] (such as manganese) will be exceeded before the PEL for CR[IV] is reached.” This information is based on work by Fiore, Reducing Exposure of Hexavalent Chrome Welding Fumes, Welding Journal, August 2006. It is interesting to note that litigation is ongoing as it relates to manganese exposure and welding products. This litigation deals with the appropriate warnings that are necessary to be placed on such products including welding rods or flux. The same considerations are also necessary for fume exposures, especially CR[IV] as it relates to welding operations. 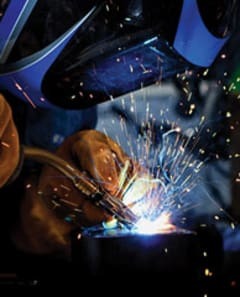 OSHA has taken the lead and is currently aggressively enforcing standards on exposures to chromium welding operations. Nickel poses similar exposures and considerations and is a companion to the chromium exposure. While necessary safeguards are outlined in all documents reviewed, inclusive of the TWA’s for the materials, little technical data is presented regarding the quantification of airborne results necessary to determine workers’ exposure when welding is performed. That leads us to the AWS (American Welding Society) Safety & Health Fact Sheet #4, entitled Chromium and Nickel Welding Fumes, dated October 2003. The AWS document amply outlines the general hazards and exposures that may be posed as it relates to chromium and nickel. The document covers the immediate effects of overexposure and outlines the chronic or long term effects from such fume exposure. This is where a contrasting element is presented in that NIOSH, while indicating a great deal more study is needed regarding exposures, says “critical differences between the studies and a shortage of dose/response data make it difficult to prepare results and confidently link given exposures with given effects.” As can be ascertained, while NIOSH poses the need for additional study its information is more pressing and determined relating to the overall exposure effects and the need for care/caution as it relates to welding fumes. While containing this information, the AWS document generally concedes to the NIOSH information. Currently, it is apparent that the lead agent of protective change will be OSHA in its requirements for TWA exposure and the need for quantification of tests to determine if such exposures exist. Similarities in all documents reviewed show general cautions provided but more emphasis on the health hazards is promoted within the NIOSH and MSDS documents for the general materials. Related to thoriated tungsten electrodes as reported by Miller Welding (www.millerwelds.com), “Tungsten is a rare metallic element used for manufacturing TIG electrodes.” They go on to indicate “These non consumables electrodes come in a variety of sizes and lengths and are composed of either pure tungsten or a hybrid of tungsten and other rare earth elements and oxides.” Miller goes on to indicate the various types of electrodes and colour coding with the most predominant being 2% thoriated, colour code red being used. Of the materials listed above, only zirconium oxide has an OSHA PEL of 5 Mg/M3 with the ACGIH (American Conference of Governmental Industrial Hygienists) maintaining TLVs for permissible eight hour time weighted average exposure for tungsten at 5 Mg/M3 and a short term exposure limit (STEL) of 10 Mg/M3. The ACGIH also has stated limits of exposure for zirconium oxide at a TWA of 5 Mg/M3 and a STEL of 10 Mg/M3. No other PELs or TLVs are promoted for the other constituents. As can be seen by this warning, and as determined by a review of other references, the greatest exposure posed is through the sharpening of the electrode points where a user may be complacent without knowledge as to the dust being generated and its relative exposure. With normal welder’s protective schemes taken during the actual TIG operation, appropriate PPE including respiratory protection, a welder would be protected adequately from the levels emitted based on the hot work being performed. This is certainly not a ‘pass’ on the hazards posed by the hot work operation, but gives great notice to the user to recognise the hazards beyond the actual hot work itself, and in the handling of the electrodes especially as it goes to work preparation and handling. The health hazard data for thoriated tungsten electrode is very typical of the basic welder’s fume exposure warnings. It is interesting to note that under Control Measures, particularly ventilation, the following is stated: “Use plenty of ventilation and/or local exhaust at the arc.” This phrasing does give warning that not just ventilation, but plenty of ventilation is recommended regarding the use of these electrodes. It goes on to recommend respiratory protection and other required PPE as expected for welders. While the thoriated tungsten electrode poses your typical welder fume exposure requiring adequate personal protective equipment, it also poses a special hazard in handling of the electrode and preparation, i.e, sanding, pointing, and requires the user to be fully aware of the exposures to the dust as well as fume. The source of exposure, therefore, is both the fume and the dust during preparatory activities. As defined by Tooling U (www.toolingu.com), the definition of thoriated tungsten element is “A type of tungsten element that contains approximately 2% thorium. Thoriated tungsten electrodes have higher conductivity and generally last longer.” Given this consideration it is clear to see that the user will make periodic adjustments to the tip and create the exposure of possible dust while preparing the electrode for continued use. The exposure is therefore increased during these periods and education of the user regarding this exposure is a must. The hazard is clear in that typical welder fume exposure is presented and preparatory work exposure regarding the dust and alpha emission within inhalation and ingestion is of key concern regarding routes of entry requiring protective practises that ensure personal safety. A great deal of education for the worker is necessary, including a review of the actual operation, extensive review of the Job Safety Analysis (JSA) for the materials being used, and set up of the job site with adequate ventilation for all activities including electrode preparation. Regarding the set up of recommended controls for the thorium exposure, that would start with the establishment of a JSA for TIG type operations requiring the use of thoriated tungsten electrodes. This JSA would start with the actual preparation of the work area, selection of electrodes including review of MSDS and work practises. Ventilation would be a key consideration on the JSA as it includes not only the hot work itself but also the location and set up for preparation of electrodes and their maintenance during the operation. This document reviewed with the worker would educate them as to the extended hazard not typical of common welding operation, and emphasise the need for safe handling of the electrodes particularly during the maintenance and preparatory phase. This JSA would emphasise the need for dust controls and collection to capture particles during such grinding or sanding and an appropriate establishment of facilities to conduct these operations. As always, it would be imperative to provide baseline testing for these operations to quantify the actual levels of exposure that are being developed.